Quick Before They’re Gone: 1.00/2 Ragu, 1.00/1 Lipton Secrets and More! 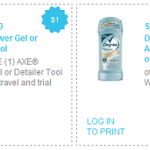 New Unilever Coupons: Axe, Degree, Country Crock & more! New Unilever coupons: Lipton, Wishbone, Breyer’s & ICBINB! *HOT* new Unilever coupons: $1.00/2 Ragu, Hellman’s & more! New Unilever coupons: Wish Bone, Dove Men+Care, Vaseline & more!